Kenneth Edward Dusenberry, 90, of Hannibal, MO passed away at 12:12 p.m. Saturday, January 19, 2019, at Hannibal Regional Hospital. Funeral services celebrating Kenneth’s life will be held 11:30 a.m. Tuesday, January 22, 2019, at the First Christian Church in Hannibal. Pastor Steve Barker will officiate. Military Honors provided by the Emmette J. Shields American Legion Post #55 will follow the service at the church. Private burial will be in the Grand View Burial Park. Visitation will be held 9:30 a.m. until the time of the service Tuesday at the church. Kenneth was born on June 24, 1928, in Knox County, MO the son of Paul M. and Gertrude M. (Woodard) Dusenberry. Kenneth hitchhiked from Fort Leonard Wood, MO to Hunnewell, MO to marry the love of his life, Marjorie LaVerne Sydney on February 24, 1951, before he was shipped off to Okinawa. Marjorie preceded him in death on September 23, 2017. Survivors include his children, Derek B. Dusenberry and wife Tammy of Naperville, IL, and Erek L. Dusenberry and wife Teal of St. Charles, MO; Brenda Sue Willing and husband Donnie of Gallatin, MO, and Debra K. Wasowicz and husband Henry of Hannibal, MO; sister, Ann Marie Gordley (Roger) of Quincy, IL; eight grandchildren, Suzanne DeShaies (J.D. ), Jennifer Jeffers (Tim), Tad Wasowicz (Hollie), Drew Dusenberry, Cody Dusenberry (Alex), Caroline Dusenberry, Rachel Dusenberry, and Jonathan Dusenberry; two great grandchildren, Logan and Hayden Jeffers; and numerous nieces and nephews and extended family. In addition to his parents and wife, Mr. Dusenberry was preceded in death by three brothers and two sisters. Kenneth graduated from Novelty High School in 1944. He proudly served his country in the U.S. Army during the Korean Conflict. During his time in the service, Kenneth was stationed in Okinawa for two years. In 2013, Mr. Dusenbery was a Great River Honor Flight recipient. This was something he treasured and shared with his family and friends. Kenneth worked for Burlington Northern Railroad as a switchman / brakeman before his retirement. 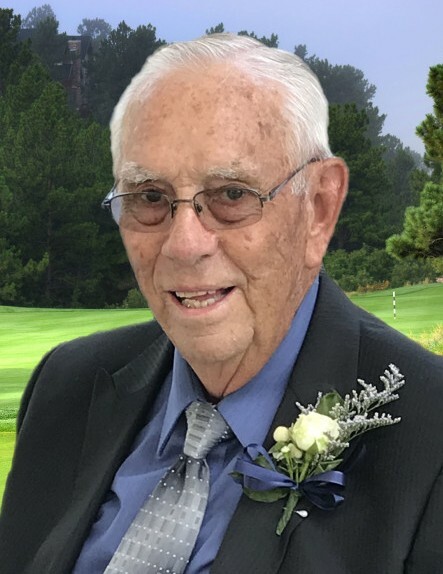 Kenneth was an avid golfer and was very active at volunteering his time to help maintain the American Legion Golf Course. At the age of eighty-one Kenneth achieved every golfers dream, a “hole-in-one.” Kenneth not only had one that year, he made two hole-in-ones. Kenneth had a love for sports and enjoyed attending as many Hannibal Pirate sporting events he could. He also enjoyed watching the St. Louis Cardinals with his wife along with taking his wife on car rides throughout the country side. When time allowed Kenneth enjoyed sitting down and reading western novels. Mr. Dusenberry was an active member of the First Christian Church in Hannibal. He served as a Deacon and on various committees throughout the church along with playing on the basketball and softball church leagues up to the age of fifty. Kenneth’s ministry was the youth at First Christian Church. Honorary pallbearers will be Tad Wasowicz, Drew Dusenberry, Cody Dusenberry, Jonathen Dusenberry, Logan Jeffers, Hayden Jeffers and David Mayes. Memorial contributions may be made to the Hannibal Nutrition Center, First Christian Church Youth Group or Emmette J. Shields American Legion Post #55, in care of the Smith Funeral Home & Chapel.